The IBM Infoprint 2000 is a high-end, 110-page-per-minute, cut-sheet publishing system. 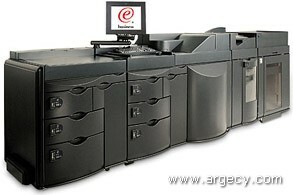 2710-RP1 (click for details) The IBM 2710 Model RP1 is a high speed multifunctional digital duplicator with upgradable features to include network connectivity and is aimed at the corporate reprographics centers, in-plant print shops and the print for pay market. 2710-NP1 (click for details) The IBM 2710 Model NP1 is a high speed PostScript, PCL, and PDF printer with upgradable features to include production copying capabilities and is aimed at the large office workgroup, and data center environments where PostScript and PCL are the predominant data streams. 2710-DP1 (click for details) The IBM 2710-DP1 is aimed at the data center environment where IPDS or the Xerox native datastream (LCDS/Metacode) is the predominant production datastream. 2710-MS1 (Click for details) The IBM 2710 Infoprint 2000 Multifunctional System Printer Model MS1 replaces the NP1, RP1, and non-Intelligent Printer Data Stream (IPDS) DP1 models. Model MS1 can be configured as a high-speed duplicator or production printer when network or channel attached to a host delivering PCL 5/6, PostScript level 3, or Line Condition Datastream (LCDS)/Metacode datastreams. Host attachment for Model MS1 is available using 10/100BaseT Ethernet. System/370 Parallel or ESCON Channel is available through the BARR or Sun hardware. 2710-AF1 (Click for details) The IBM 2710 Infoprint 2000 Advanced Function Printer Model AF1 replaces the Model DP1 that has IPDS installed. The Model AF1 is intended as a network or channel attached production printer supporting IPDS via the Advanced Function Common Control Unit (AFCCU). The IPDS Microcode Upgrade adds support for continuous Output between the Finisher and High Capacity Stacker; Post-fuser Inserter Module; FICON channel attachment; new paper sizes: 8x10, 8.5x10, RA4, RA3, 14x17, 12x18, and 14x18; and selectable IP addresses.